Highlights this month include: #WaistcoatWednesday, Charity Digital Code, IoF’s Fundraising Convention and diversity. It’s been a month of relentless hot weather, football optimism and bleak world news. Plus another bumper crop of great charity content and digital reads. How to use – pick and choose links to read, or open in new tabs for later. Or bookmark this post. Even better, subscribe and get future round-ups direct to your inbox. Enjoy! Bloodwise launched amazing reactive fundraising #WaistcoatWednesday on 7 July to coincide with Gareth Southgate’s big moment on 11 July. At one point on the day #WaistcoastsWednesday was trending confusingly. National Trust spontaneously responded with a tweet about not wasting the coast but didn’t use #WasteCoastWednesday. There was other fun football content including a forecast from The Met Office, #GarethSouthgateWould tweets including this one from Bliss, Scope’s brilliant BSL videos (see Football’s Coming Home), Give Blood’s missing Os, and many examples of Harry Maguire’s meme including this excellent one from The Horniman Museum. There were serious messages too including this striking image sharing stats about rates of domestic violence. Sane launched a disturbing video called #LetMeTalk which shows a man being violently prevented from answering his phone. The tag line says ‘Your depression doesn’t want you to talk’. Another difficult watch – Inside Childline. It’s pretty hard to make a helpline come to life. This video does it really well. Some of the topics discussed are really difficult to hear in the voices of children. Snazzy video from Alzheimer’s Research UK promoting Amazon Prime. Eye-catching gif from Shelter promoting petition sign-ups. Great use of a Moment from Whizz-Kidz capturing the stupid questions wheelchair users get asked. Video showing Anna from Oxfam’s visit to Tanzania. Have you seen Neville Southall’s Twitter takeovers? Read more in this Guardian interview. Animation of how the planes gathered for the RAF 100 years flypast. I liked this call to action to reply with the last picture of a dog you took on your phone by Edinburgh Dog and Cat Home. A simple, fun ask which should have connected well with their audience. Not sure why it didn’t take off. Can you describe your pet’s day in emoji asked PDSA for #WorldEmojiDay. Lightful collected more charity emoji day fun – how charities marked world emoji day 2018. How do you promote your members or partner organisations? I love these tweets from Small Charities Coalition shouting-out to members for Pride and the football. Also London Community Foundation showcase grant recipients, in this case following Wimbledon. Have you read and given feedback on the Charity Digital Code which launched in July? Consultation closes 25 September. Digital transformation at Wellcome Collection – ‘tent poles’ and why projects are anti-digital. Great post by Tom Scott. Future tech trends for charities to know about – Matt Howarth of Reason Digital busts the jargon. The state of mobile voice search in 2018 via eConsultancy. 5 things to try with social media advertising by Platypus Digital. Is it ever ok to sell off hashtags? asks PR Week. Useful new template library launched by Charity Comms. Lots of useful digital comms tools and tips in this thread from Sophie Drouet. Your monthly reminder about accessibility. This time – how to do good image descriptions / alt text. Bonus accessibility link – how do I create subtitles? Useful tips from the BBC. Oh and this one – Designing for accessibility is not that hard – 7 easy-to-implement guidelines to design a more accessible web by Pablo Stanley. Why GOV.UK content should be published in HTML and not PDF – so many reasons in this GDS blog post which was widely shared. The value of prototyping everything – 7 minute read from the digital team at NSPCC in their Digital Dunk series. What animal charities should know about pet owners, research by nfpSynergy. Is your charity desperately drowning in data? by Sally Dyson of SCVO. Why digital is a service enabler, not a service solution by Vilma Appadoo. 5 tips for recruiting volunteers through social media by Jenna Wood of Contact the Elderly for JustGiving. What is the right structure for your charity’s digital team? Zoe Amar investigates. What a digital organisation looks like by Janet Hughes. The benefits of undertaking a Digital Maturity Assessment by Dorset County Council. Three ways technology is amplifying the voice of the charity sector by Vinay Nair on DigiLeaders. Failure to launch: five reasons why good strategies fail by Jon Ware for CharityComms. Love this 28second video from Tenovus Cancer Care sharing internal comms around their CRM project. Insights from Tom Loosemore who helped start GDS. Art and copy: bridging the gap between design and content – great post on avoiding silo’d working by Lauren Pope. 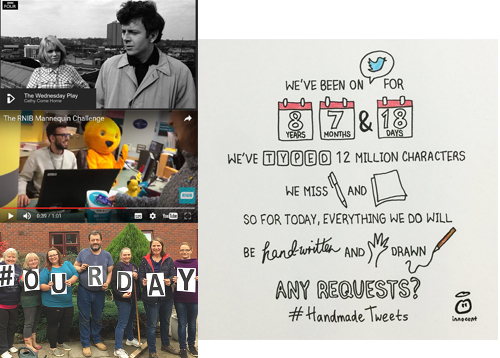 How charities are using CAST’s digital design principles via CharityComms. This month BHF launched their new website including new font. Launching a new website, even though it has been a huge project, is not always big news for your audience. I liked this promo video from SUSE (Scottish Union of Supported Employment) to launch their new site. Things to think about before you contact a web agency – useful list from agency Electric Putty. Relaunching your website? Here’s how to manage SEO. ‘What gets measured gets improved’ SEO Migration Necessities by Aimee Cuthbert. I’m a fundraiser. Crowdfunding. How hard can it be? Lucy Gower shares her crowdfunding experience via UK Fundraising. What charities need to know about Blockchain (and what they don’t) – Civil Society. What do digital kitties have to do with charities? More about blockchain. This from Rhodri Davies of CAF. Supporter experience through instant messaging – a massive opportunity says Dan Papworth-Smyth. Successfully using social media to be brave and drive social change (Kirsty Marrins) – presentation by Melissa Thermidore of NHS Blood and Transplant. Howard Lake’s illustrations from sessions were excellent too. See how to build a personal brand and 10 ways to become digital for less than a tenner. Kirsty’s blog posts wrapping up day 2 and day 3 have much more detail in them. All sing along to the GDPR song. I ran a workshop at the Hospice UK Comms Day which was about brand and reputation. Here are some useful tips from crisis expert Kitty Hamilton. Hospice UK produced a Wakelet of the day, sharing useful tips for hospices. And here is the blog post I wrote about using social media in crisis comms. Keeping your charity’s brand safe on social by Erin Niimi Longhurst on Lightful. This blog post from nfpSynergy shares themes and insights from research done with 144 journalists about how to respond to a charity crisis or scandal. Has your charity had a media crisis? Here’s some journalists’ advice. The Oxfam team shared insights from their experience at IoF Convention. Here’s a thread of the session curated by Hugh Radojev. Faking It: Fake News and how it impacts on the charity sector – downloadable report with particular reference for NGOs by IBT (International Broadcasting Trust). This month there have been lots of discussions about diversity. Vicky Browning from ACEVO shared her commitment to creating a more diverse and inclusive charity sector. Jane Ide from NAVCA blogged Diversity: it’s time to make it real and Diversity part 2: nobody said it was going to be easy. How do world leaders use Twitter? Lots of data to get stuck in to from Twiplomacy. 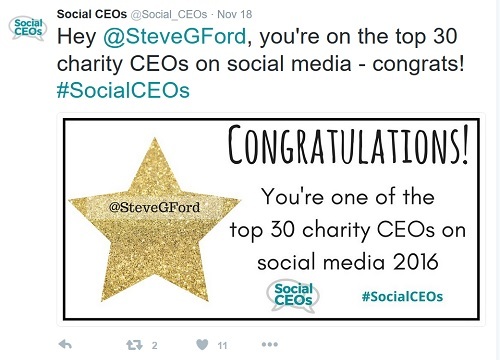 10 charity digital people who should be on your radar – some top people who regularly share their digital knowledge. Very happy to have been included. Thanks Lightful. Naughty and nice penguins of the month. Great storytelling! The fab new Stabilo adverts which were all over my timeline. The dangerous diseases lurking in caves – eww! Bold tweeting from the University of Reading. 75k likes for their non-nonsense reply about a scholarship for refugees. Are you mansplaining? Useful chart to help you check. Get down with the kids’ mums by brushing up on mumsnet acronyms. Lovely storytelling in Birmingham by HuffPostUK. I kept seeing the 20-things list meme, Doncaster Council did one well. Here’s the passive-aggressive bin font you have been looking for. Love these cross stitch control panel images from Present and Correct. Who knew that a video of a lemon rolling down the road would attract 9.5m views?! Does social media negatively affect your mental health? Why not take time out with #ScrollFree September? You don’t have to go full Cold Turkey? Cut down as a Night Owl or Sleeping Dog. Check out the website to find out more. Don’t forget to book your ticket for Being the Story in October. Super Early Bird rate ends 24 August. How small charity Brathay Trust responded to suddenly being headline news and receiving thousands of donations. In April 2018 small youth charity Brathay Trust in Cumbria had three runners competing in the London Marathon. One of them, Matt Campbell aged 29, tragically collapsed at mile 22.5 and later died. The charity received an unprecedented response. To date Matt’s JustGiving page has raised in excess of £368,000 (+Gift Aid) from over 31,800 supporters. Thousands of runners across the country also pledged to run the remaining 3.7 miles to #FinishForMatt. The charity quickly had to deal with the news, putting aside their own shock and grief from losing someone so active in their community. Here, Peter Grenville, Brathay’s marketing executive shares what happened and the lessons they learnt about crisis comms. I was told of Matt’s death first thing on Monday morning. We were aware that the London Marathon organisers were due release the news later in the morning. Colleagues were already in touch with Matt’s family, so we had a couple of hours to start working on our response. We have a crisis comms plan in place for dealing with a major incident, either during one of our programmes with children and young people, or for something affecting our offices and staff. We also have a plan in place for the ASICS Windermere Marathon, which we organise every May as part of our fundraising. Whilst both were useful, this was a scenario we hadn’t specifically planned for. We were startled by the large number of enquiries and requests for interviews/statements, which slowed our response a little whilst we prioritised. By the afternoon we had a short statement on our website and social media channels, and our tribute to Matt up later in the day. Both were posted as lead items on our homepage, and also our Challenge Events website, which had been carrying the story of Matt running to raise funds for us. It became clear very quickly that people touched by the story were donating to Matt’s JustGiving page. Whilst we had some extra donations to appeals on our website, we rapidly decided it was better to focus on the JustGiving route. Although we had an unprecedented level of interest in us (our website had more hits in a day than we normally get in a year) we were aware that people were donating to ‘Matt’s Charity”, rather that specifically ‘to Brathay’, but they were checking us out. Before the end of the first day it was clear that the those of us dealing with the unprecedented interest in Brathay needed to step away from our regular roles to work together to respond. Some decamped to a meeting room. We scheduled regular twice-daily meet-ups to check what was needed. A large whiteboard became our low-tech method of tracking things that needed doing. We prioritised tasks that required immediate attention, whilst compiling a list of less time-sensitive items that also needed responding to. Although Brathay has around 100 staff, we are spread across several sites in the north of England. Pulling this group together, especially with our own flagship fundraiser, the ASICS Windermere Marathon, just a few weeks away, did mean we had to delay some planned activity. Organisationally, our colleagues absolutely got the importance of what we were doing and left us to get on with what was needed. Throughout the whole period we were conscious that Brathay were not the ‘owners’ of anything that was going on. We needed to respect Matt’s family, who are huge supporters of our work, by not making statements about what was going on without consulting with them first. As a team, we agreed what to write and when. Once one of the team had drafted something for our websites, this was circulated and changes suggested and agreed. We did this largely by instinct – monitoring how the conversation and messages on social media were changing and ensuring we regularly responded – conscious that there was a lot of attention on what the recipient charity of the large sums of money being donated were saying. We wrote updates on day two, on day four and at the end of the first week (30 April) and shared these widely across our channels. By the end of the second week, we were able to return to our normal work, but still with an elevated level of activity and a clear understanding of the need to continue our response. After just a couple of days, the huge social media campaign to #FinishForMatt #RunForMatt (and some other variants) really took off. Messages and donations switched from being about simply remembering Matt to being about ‘completing’ the Marathon for him, as individuals or in groups. The London Marathon team really got involved with this too. People everywhere were organising runs. We did our best to contact the more significant ones, including those taking place in London, and one local to our HQ in Cumbria. Interview requests came thick and fast. Our Chief Exec was on BBC Breakfast twice, as well as appearing on other news channels, interviews with local and national radio, and newspapers. Channel 5 produced and shared this short video across their social channels. One thing that worked particularly well was identifying that people completing their 3.7miles and donating could use a text-based image on their social media posts to demonstrate their support. We quickly put together some simple graphics, loaded them onto our website, and posted about them regularly – it was great to see them being used widely. We were very aware of our place in everything that was happening, and wanted to ensure that our responses showed respect to Matt and his family. The response was incredible, but we didn’t want to appear to be trying to ‘cash in’, or treat the situation as an opportunity to ask people to give. At the simplest level, everyone involved at Brathay really wanted to make sure we did the right thing. I think what we said genuinely reflected how we felt – amazed, stunned and very grateful for each and every donation. I was keen for us to think about this from the point of view of someone donating. What would they want us hear from us? We wanted to show our gratitude to those donating. We put in a lot of time outside normal office hours to try and respond to everyone on social media who were telling us they’d donated. We couldn’t manage it entirely – there was just too many messages – but we did as many as we could. We also tweeted general thank you messages to the running community who had organised special events. We also published galleries of photos from our #RunforMatt events on Facebook, shared a few very short videos on Twitter including this one of the finish line which has had almost 1000 views and this one which has had almost 8000. We also put a selection of strong images on our Instagram account. Keeping up was tricky! We had five people from different parts of the charity working on this full-time, as well as many others involved to varying degrees. The extra hours put in by those involved ensured we responded in a way we were happy with. We discussed using an external agency to help with our social media response but in the end felt we could better maintain the appropriate tone by doing it ourselves. It’s early for us to fully understand the long-term effects and if we have developed lasting new relationships. However, more than 5000 of the 31,800 people who donated via JustGiving ticked that they wanted to hear from us. So we have emailed them updating them on the latest total and some of our thoughts about Matt’s legacy. They are now on our database, so will receive our regular updates. We’ve also built relationships with those involved in the #MilesForMatt #RunForMatt campaigns and strengthened those held with local and national media. We gained a lot of new followers on social media. Of course, we know that the interest in us will inevitably wane for some people, but we hope that many will want to continue to hear from us, and understand what we do. The amount of money raised in Matt’s name is significant to us. We need to think carefully about how best to use it to ensure we have maximum impact on the lives of children and young people. We will consider both our charitable remit and the wishes of the Campbell family to ensure we have a fitting legacy to Matt focused on the development of resilient young people. It is only a very short time since Matt‘s death and we need to respect that. While the total continues to rise, we are not in a position to finalise our plans but we are currently giving careful thought to the best way forward. We recently published a news story saying this. It is important for us to share an update saying that we are thinking carefully about how to use the money, rather than saying nothing. One of the ideas discussed to ensure we effectively communicate our plans is to have a dedicated page on our website, which will remember Matt and carry updates on what’s happening. Some of our team were close to Matt. His death was clearly devastating for them and shocking for everyone at Brathay. I’ve been humbled by everyone’s resolution to ensure that we honoured our friend’s memory appropriately, and their huge efforts in coping brilliantly with the amazing response from the public. Colleagues attended the recent memorial service, and will continue our relationship with Matt’s family, who are great supporters of our work with children and young people. Be prepared to put in the extra hours. It’s tough, but being part of the conversation at the times and in the places, where your supporters are, is essential. It’s not about what you want to say – it’s about what your supporters/the public want to know. Try and look at the situation from their point of view. Update regularly. Even if the situation is broadly un-changed. Act even faster than you think at the outset! Any time you believe you’ve got will vanish. Prioritise ruthlessly. Not just ‘today’ and ‘later’ but ‘right now’, ‘later this morning’, ‘before 3pm’ etc. If someone is missing deadlines, find a way to support the person who is struggling to keep up. Relax the ‘whose job is it?’ rule. To get things done, use people’s skills if someone who would normally do something is already stretched. Compare notes and meet regularly. Things change rapidly, and new, urgent, items come up fast. Assemble a crisis team fast – even if you don’t need it, you can scale it down easily. Better to realise you’ve got too much resource than find you don’t have enough. Remember to thank your team. They might look like they’re coping just fine, but situations like this are stressful for those involved. Reassure them they’re doing the right thing. It’s hard to know when you’re in the eye of the storm. Make sure someone senior is part of the process. Even if they aren’t there all the time, having their support is invaluable to a team trying to cope with a stressful, and rapidly evolving, situation. With huge thanks to Peter at Brathay for sharing his experience. Have you ever been in the middle of a crisis at your organisation? How did you identify it was a crisis rather than just a bad day? What worked or didn’t work? What top tips would you share? Please share in the comments. Get in touch if I can help you with digital comms, content planning, training or strategy. I work with charities of all shapes and sizes. Can I help give your comms or digital processes a healthcheck or ideas injection? Like this post? Why not add your email or WordPress username to the subscribe button on the right and get future posts delivered direct to you? !